Since I could find no answer to “who said it first,” and it would be a long and boring post to deconstruct the idea, I nixed it for today. I like cleaning, though. One of the notions I sometimes toy with when I’m working at my job for pay is how I would construct my daily life if my time were completely my own. I create elaborate cleaning schemes and routines to replace the administrative tasks of the day. One of the unpleasant results of living in an economy full of cheap consumer goods is the tendency to throw things away when they’re dirty. It’s not necessary to clean and maintain something if it’s just a temporary item or a whim purchase. When something isn’t built to last, there’s very little financial risk in selecting it and similarly, no reward for maintaining it. I can understand why it’s easier to throw things out. You know, like that robin’s egg blue faux suedine sectional sofa seen on the side of the road less traveled. No cheap consumer goods entered the house this weekend, as far as I can tell. 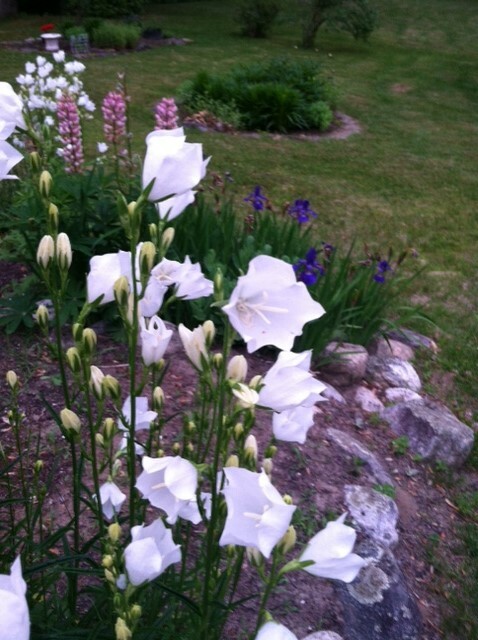 I had a pleasant weekend of housecleaning and although I did not get all my windows washed, I got enough done to start Monday off with a nod to the beautiful white balloon flowers which are currently blooming in the garden. Here’s to a sparkling Monday. This entry was posted in Experiments and Challenges and tagged cleaning, cleanliness, never enough time to clean. Bookmark the permalink.